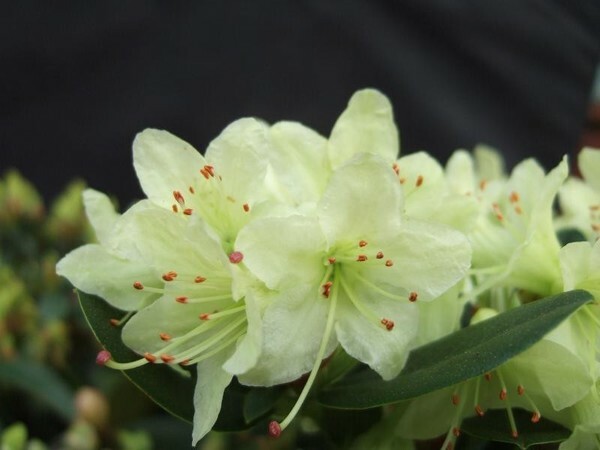 This variety belongs to the group of small-leaved, compact Rhododendron species and hybrids, whose flower-size is smaller than their showy cousins but always produced in spectacular profusion in Spring. They are perfect subjects for the small garden and many are suitable for growing in pots, providing their cultural requirements are met. They are ericaceous plants i.e. they require acidic to neutral soils (pH7 or lower) and generally will not thrive in more alkaline conditions (i.e. high in lime, pH7.5 or higher). Being woodland plants, they require moist but well drained soil that is rich in organic matter and the shelter of other trees and shrubs. This group likes partial shade but benefit from several hours of sunshine during the day, shaded from the sun when it is at its strongest in the early afternoon. Rhododendrons are surface rooting and have very fine roots so extra care is needed when planting, adding in plenty of organic matter (such as leaf mould, peat or good quality ericaceous compost) to the planting area to form a nice friable mixture. They will not thrive if planted too deeply so keep to the same depth as your plant is growing in its pot. Water the plant thoroughly and ensure the plant is thoroughly soaked at its roots at all times during any dry spells.